Dear Allie: What’s the Safest Tampon Choice? We talked a little bit about eco-friendly choices for that time of the month back in October. One of the issues with using tampons is dioxin, which occurs when the materials used to make tampons (mainly rayon and cotton) are bleached with chlorine. Dioxin has been linked to cancer even in low levels of exposure, and it’s not really something you want to put in contact with any area of your body, let alone that area. If the tampons you’re using are made with regular cotton, you’re also risking exposure to the pesticides that were used during cotton production. 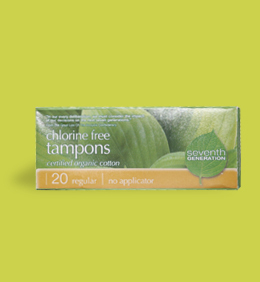 If you’re set on using tampons and not interested in switching to reusable pads, look for tampons like Seventh Generation and NaturaCare that are dioxin-free and made from organic cotton. Both brands are great, but I think NaturaCare tampons are slightly better. Go for applicator-free to cut down on waste. And, according to Umbra, you can even compost your tampons, if you want to take it that far. Another great option is using a menstrual cup like the Diva Cup, which is made from surgical grade silicon, or The Keeper, made from natural rubber. Menstrual cups are reusable, easy to use, one you get the hang of it, and because they are non-absorptive, they can be used even on low flow days or when you think you’re getting your period. Plus, one menstrual cup, which costs about thirty dollars, will last for about ten years. If you can’t make the switch to a cup or organic tampons, consider only using tampons on heavier flow days, and opt for a reusable or organic cotton pad on lighter days. Thanks Allie! This info is great! Great info! I’ve been meaning to buy The Keeper for some time now, so maybe I should get on that. the keeper/divacup is the best invention of our time. i’ve been using one or the other for about 6 years now. both are great; the advantage to the keeper is that it’s natural rubber, but the divacup is good for those with latex allergies, and it can be put in boiling water to sterilize (rubber cannot). This is one of those areas where I’m going to be adamantly not green. I’ve never found anything that I like as much as OB. But like I think I said before, by eating vegan or at least not eating a lot, my period becomes lighter and shorter than normal, and I think that makes a huge difference. All the other products just make me so uncomfortable that I become unproductive and cranky. I use OB right now…I need to see if they make an organic one. I like that they have no applicator and they are not as HUGE as tampax and other brands, even the organic ones are HUGE. Unproductive and cranky isn’t good! I do think this is one of those things where you have to do what works for you. Having a lighter period is an awesome way to cut down on tampon use! I really like NaturaCare tampons. Size wise, they seem comparable to OB (which is what I used to use) and they don’t have an applicator either. Honestly, I didn’t notice the difference when I switched over. I wish OB would go with an organic line. It would be nice to see dioxin and pesticide free tampons go mainstream. I bought OB in desperation last month and was startled by the… I don’t even know how to describe it. When you take off the plastic packaging, there’s a layer of shiny lining of some kind on the outside of the tampon (presumably to make it slide more easily). I’m guessing it’s plastic. It weirded me out. I haven’t switched to a cup yet because of the public restroom issue, and because everyone who’s ever tried to make me switch was sanctimonious about it (including not one but TWO ex-boyfriends! What do they know about it?). But a good friend made the case for it really well a few weeks ago, and now I’m seriously considering it… Things to think about. I had the same issue with going back to OB when I was desperate. That coating or what ever it is is kind of weird. The cup is great for backpacking when you don’t want to carry out that kind of waste. That’s so funny that you had boyfriends who were all about it. I don’t think they are allowed to have an opinion on this. When I first started to kick my tampon habit, that’s what I used. I got two due to the public restroom issue. I would take one out and put the other one in and then rinse the first when I got home. I don’t use the sponges anymore, unless I’m going swimming (which doesn’t happen very often) but they worked fine. I never once had an issue with them. Now I use reusable pads and am quite happy with them. That’s really cool. I haven’t tried them. Thank you for participating in Fitness for Moms Carnival 9th Edition. Please stop by and check out all the other great articles included. The tips and ideas are helpful and informative. I’ve used The Keeper for maybe five years now, and I am so glad I have it. It is simple to use, easy to clean, I never have to buy tampons, it lasts way longer than a tampon does (I dump it out maybe 2 or 3 times a day during my heavy days vs. changing a tampon every few hours), and I like being in touch with my body in such an intimate way (I know now that my blood is not gross at all). and is the diva cup comfy?